The statement quoted Pope Francis: "We want the Church to be truly a church of the poor." "Ensuring for our lay faithful their rightful place: Recognizing the God-given talents and potentialities of the lay faithful, we will, in the first place, listen more to their voice. Hence, we commit ourselves to establish Pastoral Councils in every diocese. The CBCI also appealed to the Catholic community in India to be example of simplicity, transparency, justice and mercy in a society polluted by corruption and violence. 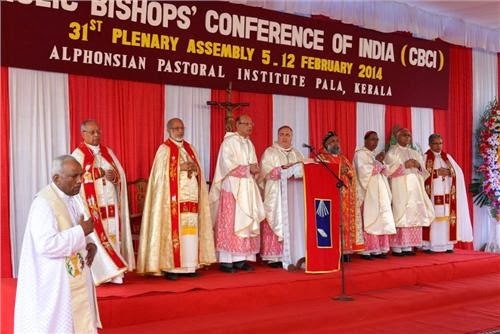 It may be recalled that while wishing the CBCI a successful session, the Cardijn Community International (CCI)- India appealed to the Plenary Assembly to come out with concrete action plan to build a vibrant and sustainable Church of the poor in India as envisioned in the spirit and decisions of Vatican II. In a communication addressed to the Archbishop Albert D' Souza, CBCI Secretary General before the start of the CBCI Plenary, the National Secretary Ms Glynis Joseph wrote: “In your capacity as the Secretary General, we request you to initiate certain proposals to the CBCI to encourage lay apostolate in India particularly among the youth and workers". Bishop Rt. Rev Oswald Lewis, Bishop of Jaipur and current Chairperson of the CBCI Labour Commission has been re-elected as Chairperson at the recently concluded CBCI Plenary at Pala in Kerala. Cardijn Community International (CCI) congratulates Bishop Oswald Lewis on his reappointment as the Chairperson of the Labour Commission, CBCI. CCI hopes that Bishop Oswald Lewis would strive to bring together all the movements in the Church in India working towards development and well being of the workers in India and form a common platform for formation and action. In particular, the Cardijn movements like YCW, CWM and CCI need more support and encouragement from the Church if the spirit and decisions of Vatican II have to be put into practice. Incidentally, CCI is commemorating the 50th anniversary of Vatican II with various activities and studies on the social teachings of the Church and lay participation. CCI-India is hosting the international conference on 'Vatican 2+50: A Cardijn Perspective' from the 5th to 8th December 2015 at Joe Beach Conference Centre, Mamallapuram, near Chennai. We are fortunate to have Bishop Oswald Lewis who is supportive of Cardijn movements heading the CBCI Labour Commission. We do hope that Bishop Oswald Lewis will extend his total support to CCI in our efforts to promote Cardijn's spirituality, vision and SEE JUDGE ACT methodology. at the 2015 International Conference. Cardinal Mar Baselios Cleemis has been named as President of the Catholic Bishops' Conference of India (CBCI). The Cardinal is currently President of KCBC and Vice President of CBCI. Cardijn Community International (CCI) congratulates Cardinal Mar Baselios Cleemis on his appointment as the President of the CBCI. We also thank the outgoing President Cardinal Oswald Gracias for steering the Church in India to become a Church of the poor. The new President assumes office at a time when the universal Church is celebrating the 50th anniversary of Vatican II. CCI too has launched a 3 year project in 2012 to study the spirit and decisions of Vatican II in the areas of its social teachings and lay participation. The 3 year project will conclude with a mega international conference at Joe Beach Conference Centre, Mamallapuram near Chennai from the 5th to 8th December 2015 with the theme: 'Vatican 2+50: A Cardijn Perspective'. While wishing the new President God's blessings in his new assignment, we look forward to a new dimension in the approach of CBCI towards social issues and participation of the laity at all levels of the Church. We wish to see Cardinal Mar Baselios Cleemis, President of the CBCI inaugurating the CCI International Conference 2015.